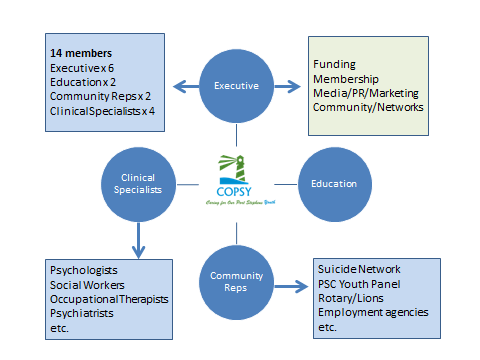 In 2014 a small group, mainly Rotarians, established COPSY and incorporated the organisation in 2015. As a group of community volunteers, with no agenda other than to support our community young people, it became apparent that we needed to conduct a needs analysis for the Port Stephens area. After significant guidance from Port Stephens Council, medical practitioners and other stakeholders, we eventually raised enough money for the Centre for Rural & Remote Mental Health (CR&RMH at University of Newcastle) to carry out a Needs Analysis in 2016. This provided credible ‘whole-of-community’ research to both back up anecdotal evidence as well as provide guidance into the strategic direction we needed to take within the community. The research report evaluated gaps in existing mental health services for youth in Port Stephen, and made18 recommendations that would see a significant positive impact for young people with mental health issues in the region. As well as this, COPSY representatives visited youth counselling services (headspace at Maitland and Newcastle, KYDS in Lindfield, the Bellingen Youth Hub and Macedon Ranges in country Victoria). We also visited all local schools in the Port Stephens LGA and talked with counsellors, principals and other relevant people about the promotion/awareness programs they conduct. We want ‘on the ground’ feedback regarding strategies from a more clinical perspective. The Steering Committee, as well as youth forums held in 2016 and 2017 guided COPSY on such issues as counselling, education and service resources required, especially as it relates to young people between 12 and 18.